Fufu also spelled as foofoo is a starchy sticky African food. It is strictly a traditional meal which is prepared almost the same way in the West African countries. They are of different types, and each type is prepared differently. 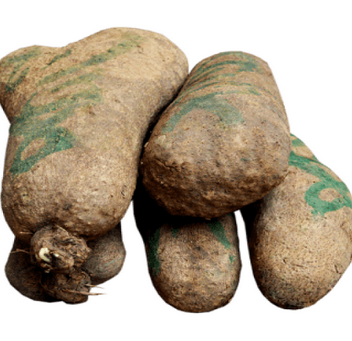 We have the cassava (both raw and powdered ), yam, unripe plantain, garri, amala, rice etc. in the west Africa ( Nigeria to be specific) each ethnic group have one or two type(s) of this swallow meal as their major food. For example, the Igbo’s take akpu and Eba (garri) made with cassava as a traditional food while the Yoruba’s take amala (dried powered yam usually black or brownish in colour), the Hausas take tuwo (usually with cassava or corn flour), tuwo shinkafa (made with rice) the Benue (Tiv precisely) have their traditional meal to be pounded yam (made from raw yam) and many other ethnic groups with their own type of fufu. Well, I may not be able to put down the procedure for all but with the few that will be discussed; many others can be achieved using the same process. So, each of them will be discussed below. 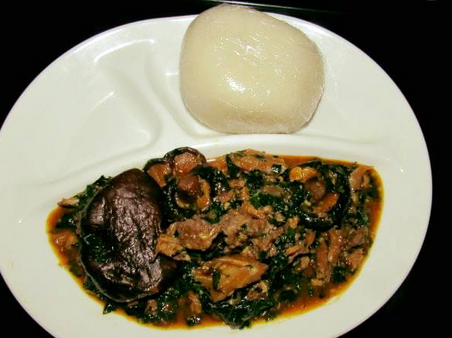 Charity they say begins at home, so therefore I will start with mine which is the Benue (pounded yam). Pounded Yam Pounded yam is a starchy fufu made from yam. It is very white in colour and a very popular Nigerian meal. It is prepared with only few steps which will be discussed below. But before then, let’s look at the things needed for preparing this meal. 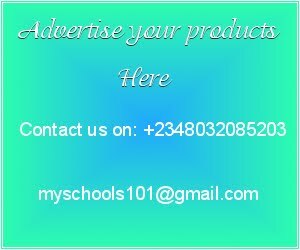 Equipments used for making pounded yam: Mortar Pestle Pot Knife Bowl White nylon Only these few things are need. Now let’s look at how it is prepared. 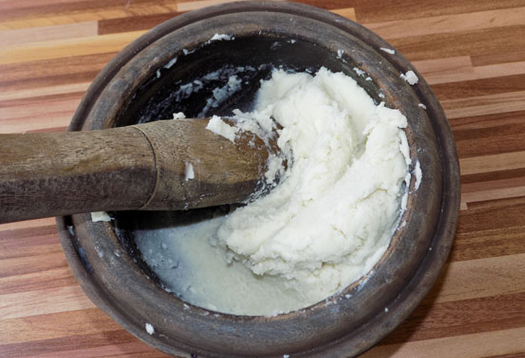 Pounded yam preparation: With the following steps, pounded yam can be prepared. Step1: Get your yam, peel and cut into small pieces. Step 2: put the pieces in a bowl and wash with water. Step 3: after washing, put it in a pot and add about 1 ½ liter of water and cover properly to boil. Step 4: Allow the yam to boil for about 25 minutes then you can check to see if it is soft enough. Note: yams are to be cooked properly in order to prevent lumps. Step 5: remove the cooked yam one after the other into the mortar and use the pestle to pound it. Step 6: pound till it is smooth and sticky then add a little water either warm or hot and pound again to make it softer. Step 7: then after that, mold it into affordable sizes and rap it in white nylon. You can choose whatever way you prefer to serve your pounded yam but just make sure that you served it when it is still hot otherwise you will not enjoy it that much. It can be taken with any soup. So make your choice. Now the next one on our item is Amala. Amala is also made from yam but in this case, it is in a powdered form. It is a brownish or black fufu with a nice aroma. It is best taken with drawl soup. It is quite easy to prepare but not the easiest. It is one of the African food that you can take while trying to lose weight because it is light and also with low calories. The starch content is also low. Now let’s look at how this fufu is prepared and also what we need to prepare it. Now that you have seen that they are actually very small or few things needed. Let’s proceed to the procedure of making Amala. And we are going to follow it step by step. Step 1: put water in a clean pot and put it to boil. Step 2: Boil the water to 100ºC. Step 3: sieve or filter the Amala powder into a bowl in order to remove the unwanted substances in it. Step 4: pour the amala powder into the boiled water and cover it for few minutes ( that is 2 to 3 minutes). Step 5: Use the turning stick to turn it in one direction, either clockwise or anticlockwise. We are expected to turn only in one direction in order to prevent lumps. Step 6: Turn until you see that there is no more lumps then add hot water to it and cover to boil for another three minutes. Step 7: Open it after the 3 minutes and use turning stick turn until it is very sticky and brownish in colour. Step 8: also mold this in affordable sizes and use a white nylon to wrap your amala and make sure that u served when it is hot. Haven’t known how to prepare the ones discussed above, we will proceed to the next one which is the easiest to prepare. 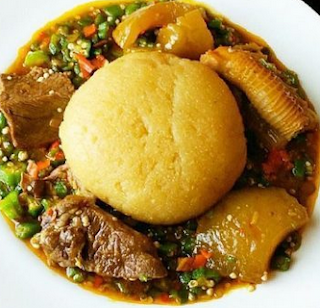 Eba is one of the best foods in Nigeria made from processed cassava tuber (garri) taken mostly by the Igbo’s. It is a very popular fufu among Nigerian students because it is very easy to prepare. It is loved by students because it saves time and also it has the ability to keep the tummy full for a very long time. It can be taken with both drawl and any kinds of soup but mostly taken with this Nigerian popular soup known as egusi. Eba provides the body with much energy. With only few steps, this food can be prepared. The Procedures for Making Eba Let’s carefully look at the steps that are involved in making this fufu. Step 1: get all your equipments ready. (That is the pot or kettle for boiling water, the bowl for mixing garri and finally the turning stick). Step 2: Use the kettle or pot to boil your water. Step 3: Turn the boiled water into a bowl, mean while your garri is beside you . Step 4: Pour your garri into the boiled water that is in the bowl and cover it for a while. You may choose not to cover and it will still be ok. Step 5: Use the turning stick to mix the garri properly and your eba is ready to be served. It is also best taken when hot. As earlier said, all may not be discussed but with steps of the few ones above, the rest of the fufu can be prepared. For example, tuwo can be prepared using the procedure for preparing amala. And for the plantain fufu,it can be done using the pounded yam procedure when unripe plantain is boiled but can also be prepared using the amala process when it in a powered form. Keeping in mind that they all have different timing. Now that you have seen that to get your Fufu ready is very easy, you can now try one and give your family another reason to call you a great mama. Don’t forget to like and comment with your email in the box below.